Combine berries in one bowl and sweeten with sugar. In another bowl, combine oats, butter, brown sugar, flour, cinnamon, and salt. Spray four 8x8 foil squares with nonstick oil spray. Preheat grill to HIGH. 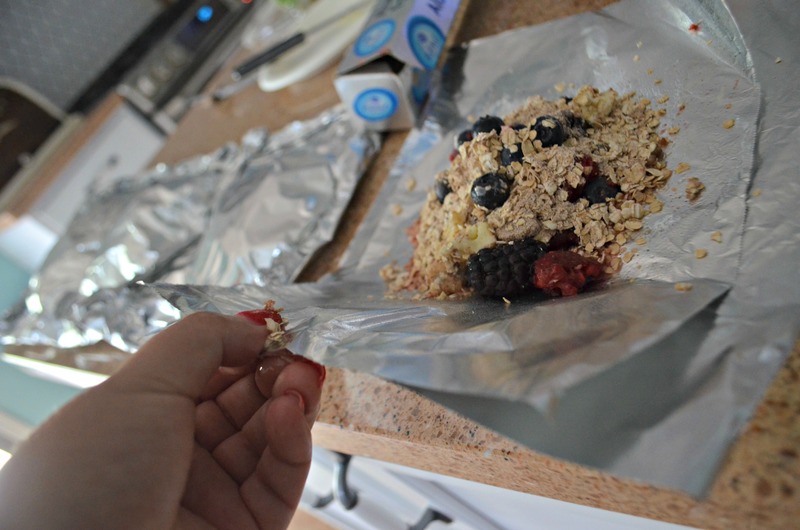 For each packet: Spoon a layer of berries onto the middle of the foil, followed by a layer of oat mixture. 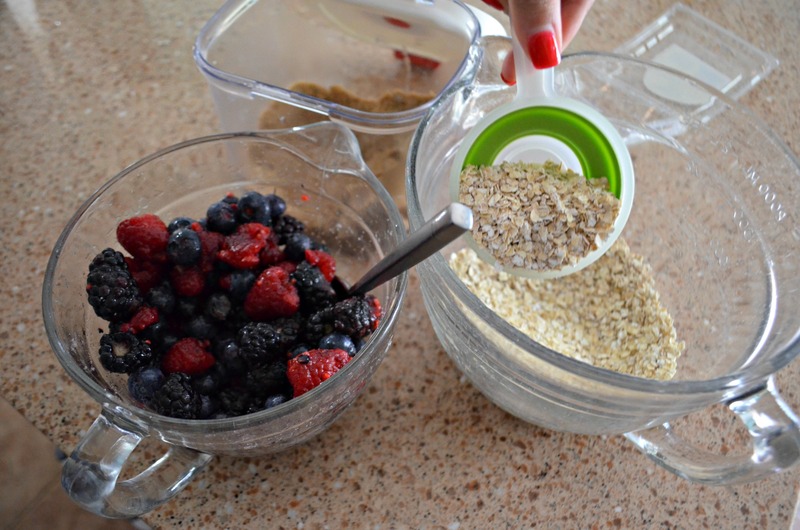 Repeat with another layer of berries and oats. Place the 2nd piece of foil on top, and seal the ends. 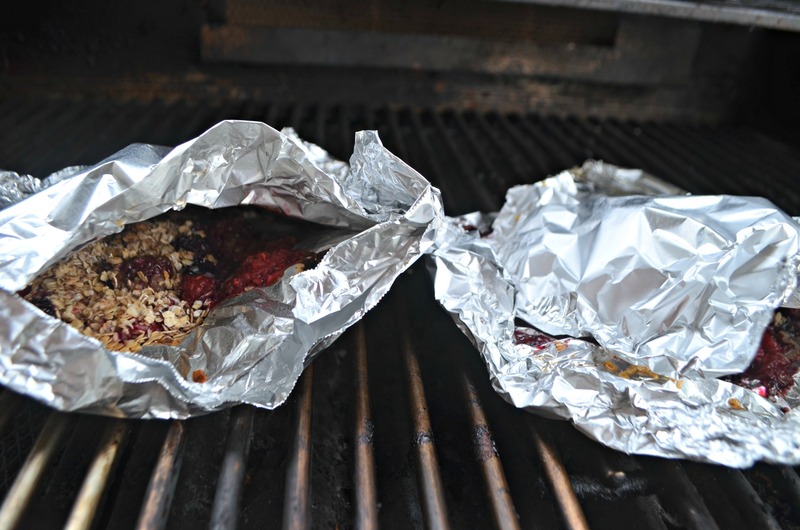 Place foil packets on a grill. Cook for about 15-18 minutes until berries are melted and bubbling, and the oatmeal mixture is browned. Alternatively, you can place over hot coals of a campfire to cook. Serve warm as is, or topped with whipped cream or ice cream. Want a fun camping or grilling dessert idea? If you love delicious summer berries, consider making these individually wrapped berry crisp foil packets. It’s similar to making a berry crisp in the oven, except you can make them on the grill or by the campfire! The result is a mouthwatering, bubbling, sweet dessert you can eat as is or top with whipped cream or ice cream. So yummy and easy to make, too! Fresh berries are topped with sweetened oatmeal and butter, then grilled for a delicious sweet dessert. We’ve all heard of popular foil packet dinners for camping and grilling, and this is a yummy dessert version! We sometimes visit Montana in the summer, and next time we go pick huckleberries, I’m so making this! You could actually make this even easier by using a maple and brown sugar instant oatmeal packet per each foil packet. We usually have those on hand while camping. My kids enjoyed helping create these packets, and it was a delicious outdoor treat. The oatmeal mixture texture gets browned and tastes so yum with the melted berries. Perfect summer dessert! Want more camping recipes? Try these! Thanks for the great idea. We love berries and I love NOT heating up the kitchen in the hot summer. Trying this weekend! These look delicious! I’ll bet we could even dice apples and make an apple crisp one. We’re planning our annual Labor Day camping trip for Girl Scouts, so this is perfect! Thank you so much for sharing! Can you sub for oil for dairy-free, and omit flour for gluten-free?